This pack is on its way to a small training team that is embedded with the Afghan Army. I hope that somewhere in that band of merry men, there is a Wallabies supporter. Since I am working down at the Circular Quay end of Sydney, I paid a special visit to David Campese's rugby shop, and bought an appropriate scarf. I'd have preferred a flag, but a scarf is better than nothing. I didn't have the time to stop and have some of Campo's coffee and cake ($7 for a slice and a coffee), but if the scarf goes down well in the hills of Afghanistan, I might have to pay the shop another visit. Im getting pretty good at making flat bread and we bout a goat of a local for 200 dollars and we slaughtered it. I got a good video. Its either catch it, kill it, or make it out here or else you go hungry LOL!! A BIG ONE that I NEED you to try do (get started ill help when I get back) is appeal to local charitys, churches, major companys ie Zoo, Cadburys, boots you name it. Write to them and explain my whereabouts and they do send gifts, chocolate, sweets, magazines you name it trust me a lot of the lads parents did it and they've got clothes, the lot. Trust me Red bull, lucazade, fags AND SWEETS are wicked just keep sending them and URGE people to send photos they keep the moral SKY HIGH. Lucas Paw Paw Ointment is magic. Great for cracked, dry lips and fingers, good for cuts and scrapes. Good for coughs, colds and sore.... ah. You know. I've been looking out for a little spice container to send with some herbs in a parcel. Haven't had much luck, though. The lamb herb mix had all those spices in it. Easier than putting together a bag of mixed spice. No goat spices available in our supermarket though. Good on you Fran. Welcome to the club. I can't see why cigarettes should not be allowed. If none of the diggers smoke (ha ha) they can always trade them with the Afghans for something. I think a beanie would be great. I understand the nights can get pretty cold over there. Cigarettes - no, beanies are fine. I will get some beanies then. Not fussed about the cigarettes, just want to be able to provide variety. I am finding this an excerise in giving myself warm fuzzies! I had been casting about for something to do that was of benefit to others, and sending care packages to soldiers suits perfectly. My husband says it is great, he told his workmates-however one person in the office replied that "the soldiers don't need the parcel, if your wife wants to do something worthwhile, she should sponser a child in Bangladesh". 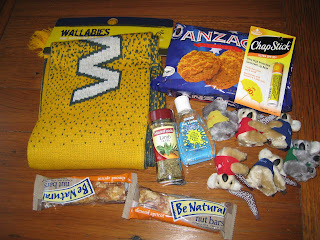 I don't want to disparage child sponsers, but Aussie soldiers do need these parcels, don't they? And I know where my money has gone! Well done to you, Fran, and good on your husband for passing the word around. As for the person who thinks that soldiers don't need your warm wishes and a bit of care, I'd ask them how many soldiers they know. In any case, if a person wanted, they could still sponsor a child as well as send an occasional care package. I just prefer to send these; as you say, you know where it's going, and that it's appreciated. Bummer about the no on ciggies, though. It had crossed my mind, but I'm a non-smoker who gave up even purchasing them for mates years ago. Again, well done and as Boy said, welcome to the club. I have found the address label and masking tape weigh 10 grammes. By way of clarification - and apologies for the brief reply yesterday (I had people arriving for a BBQ)- Smokes are not allowed through the post. In fact, that policy is designed to work more the other way. As I mentioned in my post, there is a welfare setup in most places for basic amenities. Cigarettes are available at the PX or the AAFCANS or whatever has been established in-theatre. They are also duty free. The rules on posting tobacco are aimed at stopping the boys buying cheap durries in bulk and sending them home to themselves for when they get back. I wouldn't bother with them. The herbs are a great idea. It hadn't occured to me to mention it, but it was something I PRIDEMed from Mrs Sharpe. We were self-reliant for rationing, and had to cook for ourselves. Herbs and spices and those Continental recipie packets were a godsend. Most of the guys in the 'Ghan are eating in messes or are on hard rations whilst on patrol. In those circumstances, things like Tobasco or mustard can make a "B" pack almost palatable. There is really not much you can do for goat though, and it will completely ruin a bolognase. Tabasco and Nando's Peri Peri sauce go over well. A well known military axiom is that you can serve up boiled cardboard with enough Tabasco, and the diggers will come back for seconds. Feedback says; more Twisties and lollies, car, motorbike, and lads magazines. Off duty hours are pretty boring. Before your next "holiday" overseas, you should dine at an Indian restaurant that does goat curry. Once you've had a good one, you'll spend the rest of your life seeking out Indian restaurants that do a good goat. A badly cooked goat is like eating a combination of old socks and shoes that have been put through a shredder, but a good goat is quite divine. Unfortunately, our spice makers have not yet seen fit to include a goat blend in their lineup. For goat think Greek spices. Recently I heard George Colombaris say that in Greece they eat goat, not lamb. I've had a goat curry cooked by a Fijian Indain chap years ago and it was delish. I've also had goat cooked on a spit by a Police cook with a Greek wife and it was really tasty and tender. I'm a furrin devel, so can't really participate, but, here's a list of things that I wish either had existed, or I'd known about, when I was young, indestructible, and loitering around various parts of this planet's underbelly. Instant mashed potatoes packaged in small pouches designed to "serve 4". A 4 servings that actually just about perfectly meets the volume requirements for one working person. Can't find a link but I do know it exists since I lay up a box or two of the stuff in late fall for my winter carb binge needs. Barbecue rub. There's lots and many to choose from. Spice mixes that go real nice with a bowl of mixed mash taters and beef "stew". A small stainless steel bowl of light gage (not necessarily thick enough to actually cook with, but sturdy enough to stand up to being crammed in a ruck and such.) A little bit of cleaning gear, such as those dish scrubbers made from balls of plastic netting, and a travel sized liquid dish soap. All that's needed for a belly stuffer is hot water. It doesn't really matter if a soldier is manning a repair shop, an admin desk, out on patrol, or standing watch, it is always nice to have something in the bag to cover for meals that have to be missed or that would rather be avoided. As good as cooks can be, not every meal is a feast. Saline nasal spray. There's always a nasty stink that needs banishing. Some of the dust that blows up is made from pulverized poop, either animal or human. Once you get to know that, dust packed nostrils are... well... icky. Also, strangely enough, "fiber bars". Not so much for "keeping regular" but for a light weight, non melty, easy to eat something that can serve to keep a man's belly button from resting on his backbone while he's out and about. Fiber stuff, naturally, sticks to the ribs a bit better than most other sorts of chewables. Powdered flavorings for water. Water is life, yeah, but when out and about in such places as soldiers tend to go, it's also chlorined and rather nasty. I remember waters that made a man thirstier for drinking them. Anything that makes the water taste a bit less bleh is a good have. Anyhoo, it's a good thing y'all are doing. It's about time, too. I was starting to get embarrased for y'all.